Shanghai has opened the first online pre-litigation mediation platform on Tuesday, Sept. 8, to be used by a district court in response to the increasing number of civil cases involving a foreign party, the China Daily reported. The report said that the online platform was created for foreign firms that find it hard to attend mediations, in which disputes can be settled outside the courtrooms. According to the report, with online mediations, both plaintiff and defendant in a lawsuit do not need to personally appear in a courtroom with a judge. Instead, all of them can go online through video chat software to discuss matters and reach an agreement. The report added that civil and commercial cases involving foreign parties are increasing in number, with an average rise of 11 percent per year for the past five years. "In Pudong New District, where the China (Shanghai) Pilot Free Trade Zone is located and many foreigners work and live, the number of cases involving a foreign party is higher," Cao Zhengquan, director of litigation services for the People's Court of Shanghai Pudong New District, said. "So we resort to online mediation to provide people a way that makes mediation more convenient, efficient and less costly." 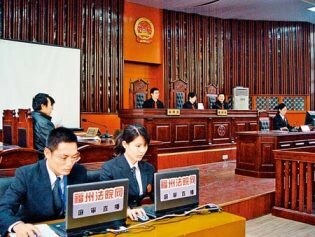 Cao said that many divorce and debt dispute cases that involve people who live in a foreign country are handled by his department. He added that it often took a long time for parties involved to exchange evidence and submit materials to the court, and it was even more inconvenient if the person involved in a case was from a country that does not have judicial cooperation with China. Cao said that in such cases, the court had to request for assistance from the consulate of other countries. "Now with video and audio available for online mediations, the two parties can present evidence during the video chat that can be accepted as legal proof," Cao added. The report added that online mediations will be used in cases with clear facts, where the rights and obligations of the parties involved are clearly defined, and in cases where only a handful of evidence are presented, such as disputes over loans or labor contracts. It can also be used on cases involving private lending and changes in custody. To use the platform, people would have to download a special application and log in with a user name and password provided by the court. That is the only way they can participate in the video call, the report added.